How Can I Support Pollinators? Whether prairie plant or pansy, native or ornamental, gain insight into all aspects of gardening & wildlife. Why NOT to cut your perennials this fall.. Most gardeners will associate the cutting and removal of perennials and raking of leaves as typical autumn chores. Naturally we want to ensure we are left with a garden that looks tidy and presentable, and we can rest assured that come springtime we will not have to tackle these chores in addition to controlling spring weeds. However removing all this plant material can be fatal for next year's butterfly population. 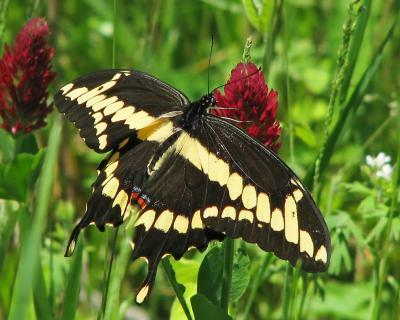 By cutting down and removing dead plant material prior to winter, gardeners are unknowingly also removing the overwintering sites of many butterfly species. Dead vegetation, peeling tree bark and leaf litter all serve as suitable hibernation sites. Butterflies can overwinter in any stage of their development; egg, caterpillar, chrysalis or adult, species dependent. A swallowtail butterfly will overwinter as a chrysalis in plant stems or within leaf litter, whilst the viceroy butterfly will seek shelter as a caterpillar in a fallen, curled leaf, and the question mark butterfly will overwinter as an adult nestled in leaf litter or under tree bark. By removing dead vegetation or leaf litter we can actually jeopardize next year's population. For many meticulous gardeners it seems unthinkable to allow dead vegetation to stand, not to mention allowing leaf litter to remain. However a compromise can be reached to achieve both aesthetic appeal and support beneficial wildlife. Be sure to remove leaf litter from lawns and other prominent areas, yet allow leaves to remain in garden beds and set-back areas. Be watchful to remove diseased plant material. Mulch leaves with a mower so that these look less intrusive and break down faster. Leaf cover provides insulation, thereby protecting more tender plants from cold damage; it acts as a soil amendment, nourishing soils and supporting soil microorganisms as it breaks down; and it is a natural weed suppressant. As butterfly and pollinator plantings continue to gain in popularity, it is essential we also turn our attention to the overwintering of these creatures. Few butterflies such as the Monarch migrate, most overwinter here in our very own yards. If we want to enjoy butterflies during the summer in our pollinator gardens, we must ensure they survive the winter. Other beneficial predatory insects that overwinter in stems, leaf litter and tree bark include ladybugs, lacewings, damsel bugs, assassin bugs and ground beetles. These insects are critical in controlling next year's garden pests. Overwintering insects and caterpillars also serve as an excellent food source for birds. So this winter why not enjoy the exquisite winter interest perennials offer, whether in the form of attractive flower heads, seed pods, magnificent branching, or graceful plumage rising out from under a deep snow cover. What could be more rewarding than enjoying a goldfinch eating the seeds off a coneflower in your garden?